Due to the park setting, flat shoes and comfortable clothing are encouraged. Space suits optional. Due to the mature nature of some performances, this event is not recommended for children under 12. Once aboard the trolley, Starcatchers will have the option of riding to the mountaintop or disembarking at Sylvan Road to enjoy a lovely stroll up the nostalgic “old road” past the stone “Troll” booth to the Star. Wander at your own pace from the Star to the Zoo. Sit or stand, stay as long as you like while making stops along this magical theatrical journey. Enjoy storytellers, musicians, treetop aerialists, Shakespeareans, comedy improv, slam poetry and short Star Story plays performed by area theatre companies and high schools. Find yourself at the Galaxy Café for dinner and drinks, and then visit the four-legged performers at the Zoo. Storytellers await you beneath the lampposts along the Star Trail to share real-life tales and tidbits related to the star. Sabrina Woods and Lindsey Wyatt bring their aerial silk ballet to the treetops of Mill Mountain. Spot the improv dancers dressed in white who will be floating like stardust on the mountaintop, bringing informal movement and energy to spirit of Starcropolis. It’s a tradition! Enjoy a glass of fresh lemonade. The same brew that was served before every performance on the veranda of the old Rockledge Inn, home of Mill Mountain Summer Stock Playhouse. Enjoy a sumptuous Southwest Virginia picnic dinner created by Blue Ridge Catering featuring BBQ or fried chicken. Vegetarian option available. Dinner ticket $20 ($15 in advance). A cash bar will offer beer, wine and soft drinks throughout the evening. All alcoholic beverages must stay in the café area and may not be carried past the Fishburn Main Stage or to the Zoo. Enjoy the four-legged performers who will welcome you at the Mill Mountain Zoo throughout the evening. Your Starcropolis pass is your admission to their zoological dance… the same one they present every day on the mountaintop. Although the Zoo will be closed to the public on Sunday, it will be open to Star Catchers 4 – 7:30 pm, including the gift shop, and the Zoo Choo will be running. The Shelter Satellite Star Stage: Four different Star Story plays performed in rep every fifteen minutes by dynamic area theatre companies, including Showtimers, Off The Rails Theatre, and Attic Productions. The Rocks Stage: Rising stars from area high schools perform short Star Story plays in rep every fifteen minutes up at the Rocks next to the Star! Slam Poetry has become a national phenomenon. Native Roanoker, Jared Singer has emerged as one of the most celebrated slam poets in the country! Enjoy Jared’s poetic take on the star through this unique form of theatrical Star-Storytelling. Big Lick Conspiracy, Roanoke’s own comedy improv troupe will “take the offer” and create spontaneous star stories and other stellar shenanigans for your entertainment. Star Stories…If the Star Could Talk will be an entertaining evening of original vignettes and monologues woven together with musical charm, capturing the human comedy and drama that occurs everyday at the overlook of the Roanoke Star. There’s something about the atmosphere at that overlook. 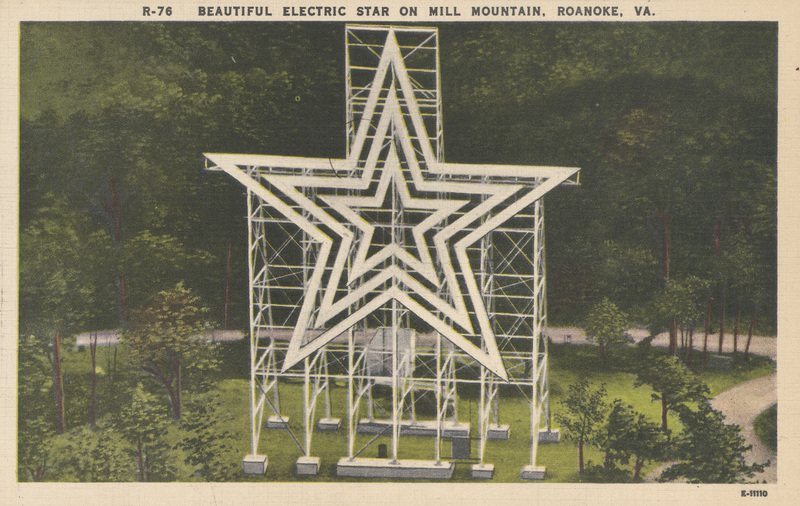 Ignited by a spectacular view in one direction and the gleaming glow of neon in the other, Star Stories celebrates the people of the Roanoke Valley and that unique, beloved icon that illuminates our community and our lives. The show begins at 8:30 p.m. (door open at 8 p.m.) during the magic of twilight under the swooping curves of a festival tent. Star Stories is presented by a team of artists assembled by the Hollins Theatre Institute directed by Ernie Zulia. Anyone can add their story to the project by visiting the Star Stories website (roanokeva.gov/starstories), calling the voicemail line at (540) 632-2203, or by email to virginiaroom@gmail.com. During Starcropolis, the Roanoke Public Libraries will be recording oral histories at the “Starry Corp”Star Story Depository located on the Star Trail. Stop by to record your Star Story, or deposit your written story into the Star Story archive with staff members from the Roanoke Public Libraries. Meet special guests including Bob Kinsey who threw the switch the first time the Star was lit in 1949. Everyone has a star story and the library is hoping to record yours. Stories will be archived in the library for the enjoyment of the public and to be used by future playwrights as inspiration in the next batch of great plays!